While the multisampled patches can be hit and miss, Ethno 2's splendid selection of loops is highly desirable. Huge library of world loops. Mostly excellent sound quality. New tuning system. Unlimited parts in one instance. GUI not so intuitive. Some multisamples lack realism. Convolution reverb quite a CPU drain. 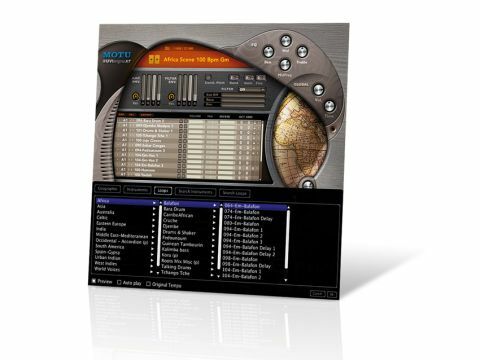 MOTU launched the original Ethno ROMpler in 2006 as a plug-in/standalone combination that proved a very convenient way of accessing a variety of exotic sounds. Some of that material came from previously released sample titles and this remains the case, but Ethno now offers 21GB of content spread across three DVDs, as opposed to the original's 8GB. The Ethno GUI is still conveniently contained in one window, and its mildly eccentric design remains a matter of taste. One instance of Ethno will now play as many parts as your system can handle, so 'scenes' consisting of many layers of instruments can be rapidly configured within the plug-in. Typing in the browser window will quickly locate material - a handy new feature. As with v1, the sounds fall into two basic categories: Instruments, this time offering 875 playable multisampled patches; and Loops and Phrases, totalling 7600. The instruments are African, Asian, European (including Spanish, Eastern and Celtic), Caribbean and Australian in origin, and there are vocal performances from each region as well. Delving quickly into the library, West African balafons, 'tango accordions' (bandoneon, surely - it certainly sounds like one! ), Arabic ouds and Celtic harps, for example, gave convincing results. There are a good number of new instruments, such as larger African drums, Polynesian percussion, more Balkan voices and a gaggle of gongs. Then there are the new tuning features. One new feature of Ethno 2 is that many instruments offer authentic, non-tempered tuning or Western chromatic. For example, the ngoni, a funky six-stringed harp from Mali and neighbouring countries, is tuned to a kind of pentatonic scale, but not quite an equal-tempered one. Using Ethno, we could bring this into line using an altered, tempered version that sat better in a track that also had typical pianos and guitars. However, when more exposed, playing with just percussion in its traditional setting, the naturally tuned ngoni could be used for greater authenticity. There's a menu of non-Western scales, containing up to 24 tones that you can map to your chosen instrument. Ethno accepts files in a format called Scala, which is an established standard. Scala tunings are simple text files than can be dragged and dropped into the tuning menu, and you can create your own as well. While a greater number of sample layers (velocity, round robin and so on) doesn't always translate into better sound quality, realism and usefulness, we do feel that some instruments in the collection would benefit from a more detailed, layered sample set. And the violins are unconvincing, as multisamples often are. In our opinion, Ethno's strength is still its Loops and Phrases library. Of relevance to this is the new timestretching algorithm which, although not perfect (Spanish guitar phrases, for example, didn't pitch up that well), worked nicely on things such as voices. The convolution reverb helps bring much of Ethno's material to life and it's now easier on the CPU. Even so, patches that use it can still be quite CPU-intensive, and while presenting no problem to our MacBook Pro, some caused a dual 1.8GHz G5 running Logic Pro to stall noticeably. Also new on the processing front is an analogue-style EQ and eight new filter types. Despite the limitations of some of the multisampled instruments, Ethno Instrument 2 won us over with the sheer variety of loops and phrases, and the rapidity with which it's possible to combine them into a rich-sounding mix.